When I described this project to my publisher, he immediately proposed the title Fairy Tales. I accepted willingly, although I’m not particularly fond of titles in foreign languages, especially since ten years ago, when I presented my first work, Presences, some criticized the choice of English titles. 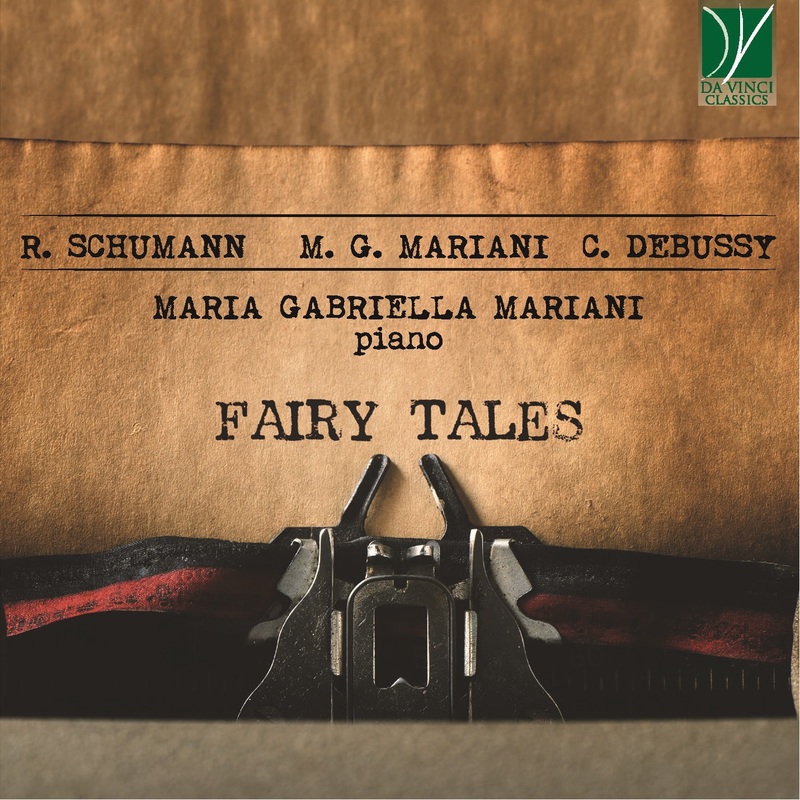 Stories, fairy tales, “fantasy pieces” – as Schumann would have put it- are in fact the red thread of this Album, in which the compositions were chosen not merely for their use of similar extra-musical subjects, but instead due to their poetic consistency. The world of children is like a shelter, or even a way of living to be attained, at least for me. As possibly Schumann viewed it, this enchanted and fantastic dimension an exclusive domain of children: indeed my intention is to recover it as an adult and bestow it with awareness. If it is true that children really behold the power to be amazed, my path must turn towards the past, in quest of wonder: a wonder seen through lenses which unavoidably differ from those of childhood, different, and, in certain aspects, mythical. Reading about the ideas and sources of inspiration behind Opus 15, I think I am rather close to the author’s intentions: in Kinderszenen Schumann did not stop at a musical portrait of his family, which, in 1838 he did not yet even have. I dare say that he would not have created such an insight on his domestic life, even if he had already had one. Scene d’Infanzia (Childhood Scenes) are more of an evocation rather than a description, in which the images suggested by the twelve titles become part of a larger romantic fictional world, in which childhood coincides with an auroral age, with an ideal world. The approach adopted by Debussy, who dedicated Children’s Corner to Chouchou, is much more realistic. More realistic because truly lived: most of the pieces refer to real atmospheres, or to objects actually owned by his daughter. The last work in the collection recalls and translates in a highly personal fashion the “Cake-walk”, a dance which was fashionable in Paris in the early 1900s. Since I have been inspired, in the composition of my Kinderliana, by a kaleidoscope of different approaches and references (some of which are more distinctly intimate and human, while others are more ironic), therefore I decided to include this possibly too well-known piano piece in the collection. My own compositional work is, at the same time, both musical and narrative, and the two are inextricably linked and connected. Like Schumann, I too wished to enter a world in which opinion and imagination could coexist; moreover, I composed this work in parallel with a collection of stories with the same titles, except for Introduction, Memento and Conclusion. Thus, behind each piece there is a story; for this reason, rather than scenes, I would say that each composition features a character, protagonists of their own stories: the dancer, the knight, the animated doll, the parrot. Just like Schumann, I imagined a stage on which the characters (puppets), bring their stories to the public’s attention. Therefore, on the occasion of a mise en scène of Kinderliana that I worked on, my vision became a reality: young actors were the protagonists of the stories and their presence on stage framed the musical performance. Kinderliana opens with fantastic and imaginative stories and is slowly enriched with increasingly tragic and human content. As I realized that the tragic elements were taking over the more playful and ineffable ones, I started to worry. But then I thought: fairy tales, just like the main characters of the stories, Dora and Lucia, grow up; the most heartbreaking and inexplicable truths are often hidden behind most stories. In fact, both the tales and the musical collection are addressed not only to a young audience. Rather, their message can be seen under various lights; it can be understood by adults who have rediscovered a child’s innocent worldview and managed to transform human tragedies in a kind of surreal catharsis. Magic does not come only from the spells of fairies, but rather from the miracle of the human soul, young or old; this I address through Fairy Tales, aiming at moving and inspiring it. These notes are not intended as a technical-stylistic analysis of the compositions I presented above: in my view, neither Schumann’s Opus 15 nor Debussy’s anthology are in need of introductions or commentaries. Moreover, it is not easy for me to write about my compositions. Instead, I thought that I should explain my choice of creating a large story with many characters, both real and invented, from Chouchou to Dora and Lucia, from the attention-seeking child to the one who does not want to sleep, from a knight made of clay to one on a rocking horse, up to the dancer or the little Alin. All have their own individual part of the story to tell on the great stage of life. The audience, comfortably seated on their chairs, are free to experiment empathizing with all characters, perhaps remembering childhood or reflecting on the many evils of life that only fairy tales can sublimate in a wonderfully disturbing way. Claude Debussy: (b St Germain-en-Laye, 22 Aug 1862; d Paris, 25 March 1918). French composer. One of the most important musicians of his time, his harmonic innovations had a profound influence on generations of composers. He made a decisive move away from Wagnerism in his only complete opera Pelléas et Mélisande, and in his works for piano and for orchestra he created new genres and revealed a range of timbre and colour which indicated a highly original musical aesthetic. Maria Gabriella Mariani: Italian pianist, composer, and writer, she studied first in Italy, then in France. Since 2008, in addition to holding concerts, she has also dedicated herself to the activity of composer. Her first CD Presenze (2008) contains seven solo piano works inspired by her first novel with the same title. In the same year she composes Fun Tango.Three radiant flows of a single matrix, a piano work in three movements, with which in 2017 won 3 Global Music Awards in Los Angeles both as an composer and a san interpreter. Her novel Imperfect Consonances is linked to Fun Tango, both published in 2010. In 2009 she composed Il Cielo s’inabissa (The sky sinks) and Traces, a piano sonata in three movements, and in 2014 recorded Riflessi (Reflections), solo piano pieces connected to the homonymous collection of stories written by her, focused on a fantastic wheel of time. In 2011 she dedicated to her Maestro Aldo Ciccolini the sonata Pour jouer (the only existing work written for the great Italian - French pianist) that performed in 2014 in his presence on the occasion of the institutional event “Tribute to Aldo Ciccolini”. The latter, after her performance, so expressed himself publicly: “I recognized myself very often during the execution of this piece, a masterly performance, which at the same time reveals a personality, like that of the Mariani, that is truly exceptional, with extraordinary pianistic means. I express my emotion, all my pathos in hearing to this monumental work dedicated to me”. In 2013 is the turn of Solo and In the name of the father and the son; the latter composition, a work for two voices, piano and chamber orchestra, is connected to the theatrical booklet of the same name written by Mariani also in the form of a novel. Her recent compositions are: Hologram - Theme, 17 Variations and Finale with improvisation (2014) and Kinderliana (2017), a collection of pieces connected to the Fairy Tales of Doracia, equally written by her. She has performed her compositions in the major Italian theaters, music conservatories, festivals and associations. Her music has been broadcast on RAI TRE, RSI.ch of Lugano, Radio Classica (“Il Pianista”) and have obteined flattering appreciations and reviews on authoritative music magazines. Some of her scores are published by Da Vinci Publishing in Osaka. Robert Schumann: (b Zwickau, Saxony, 8 June 1810; d Endenich, nr Bonn, 29 July 1856). German composer and music critic. While best remembered for his piano music and songs, and some of his symphonic and chamber works, Schumann made significant contributions to all the musical genres of his day and cultivated a number of new ones as well. His dual interest in music and literature led him to develop a historically informed music criticism and a compositional style deeply indebted to literary models. A leading exponent of musical Romanticism, he had a powerful impact on succeeding generations of European composers.